Here you will see the list of tables available for import. To select the tables you want to be imported, check boxes next to their names. If are going to import a table with its Foreign Keys, you must also import the tables to which these keys are linked. If these tables in their turn have FKs, the successive linked tables must be imported as well. If you are using a 30-days trial version of SQLyog, you are only allowed to import two tables at a time. After you have selected tables to import, you will see several buttons appeared next to each table. With these buttons you can call dialogs to specify more detailed settings for your import session. 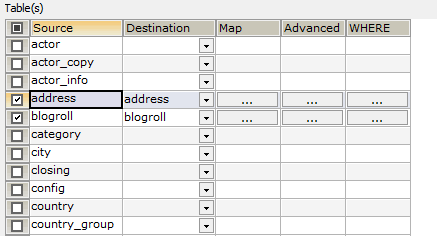 The button Map opens the Column Mappings and Transformations Dialog. Using it you can select the columns to import to your target tables and set column attributes. The button Advanced opens the Advanced Options Dialog. 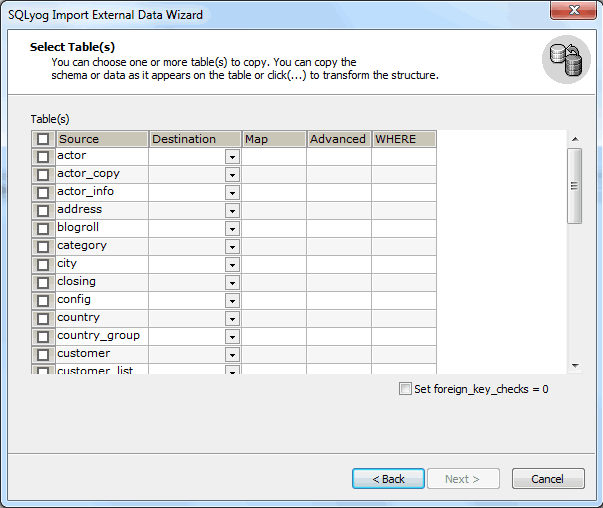 With this dialog you can give directions as for treating existing tables and duplicated data and use the unique feature of Triggers on import source. The button WHERE opens the SQL WHERE Dialog. Here you can specify a WHERE clause to import only certain rows from your source tables. The option SET FOREIGN_KEY_CHECKS = 0 should be checked while importing to a table having a Foreign Key -dependency on another table. There is no way to ensure that operations on 'parent' and 'child' tables are performed in an order that does not raise an error during import. But as always when doing SET FOREIGN_KEY_CHECKS = 0 the user must ensure that the operation does not result in broken references.